Since I first started Zoomstart I’ve thought of a number of things I’d like to do to add some value to the site. I’ve had some great success in the past with free downloadable resources. A flash measurement converter I put together was picked up by an Italian PC magazine. And I recently got an email from someone at the Fermilab National Accelerator Laboratory regarding it. I hope my converter calculations are all in line. Wouldn’t want to be known as the guy who was responsible for blowing up the Galaxy! As a free downloadable, I’ve decided to put together a short little free Ebook over the next few weeks. Now, I know I can’t write 100 pages, but I can write 1. And I can even write 10 or 20. A key part of every business plan is asking the market (that’s you guys) what people want. Find a need or a desire and fill it. Simple. A lot of companies don’t do this. They simply have an idea that THEY think is brilliant and unleash it on the rest of the world. First off, I have to rule out a few topics. I’m not going to write an Ebook on Afrcian body art. It’s kinda cool. It’s just not my strong suit. It has to be on business or money, and for now I’m staying away from the old “make money online” stuff that a lot of people are writing about. If you like one of these ideas, leave a comment. Make a case for your pick. And of course, I welcome all your ideas on other subjects that fit in with the mix I’ve listed. I think both Branding and Property Staging sound like interesting topics. Chris Garrett had a similar idea with his “Killer Flagship Content” and I think he has done quite well with that. Good luck. Thanks for your input. I saw Chris’s Ebook. There have been a few internet related ones lately, which is why I’m staying away from directly related internet topics. Of course, some of the topics I listed could apply to any business or endeavour … including on the web. I would really like to see an ebook on your trials and tribulations on business development from idea – to reality – to profit. It would be cool to hear about the troubles you experienced along the way and the methods for achieving success and sticking through it that have helped you. That said, I’m going to add more of my own experiences to the blog piece by piece. As for the Ebook … hmm … I’m gonna have to think about whether I can condense something like that down to a dozen or so pages. Thanks for pushing the boundaries out! Always appreciated. A lot of companies don’t do surveys or market research because they’re afraid that the feedback they’ll get is not exactly what they want to hear. Big mistake. Big. Huge! Thanks for the input Jon. I like the whole subject of branding a lot too. A writing style is certainly part of branding, whether it’s on a blog or it’s in the company marketing ‘proganda’. It sets the tone. Thanks for sparking my brain on that point! I think branding sounds like a good topic and on the subject “managing your money” you can always visit my blog…..lol. If I didn’t mention it earlier to well you certainly have a great writing style and creativity. Looks like branding is the popular call here. I’ve been enjoying your articles on investing in stocks recently. It’s great to get an experienced opinion on this stuff. My buddy Tom and I both share a very aggressive stance on trading, but you’ve got some sound strategies that make a lot of sense! 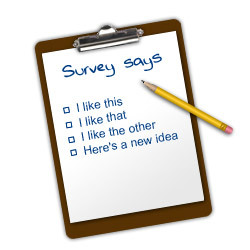 It’s a great idea to ask members of your community what topic they would like to see an ebook on. Have you also considered looking at your most popular articles on this blog for a further indication of what direction to take? I always pay attention to my most popular articles. They’re a great barometer for telling me what I’m doing right and what needs more work. And I love the feedback from just asking. It’s important to ask everyone that reads your stuff what they’d like to read next. It’s the best way to make sure you’re on track and you’re connecting with everyone as best you can.